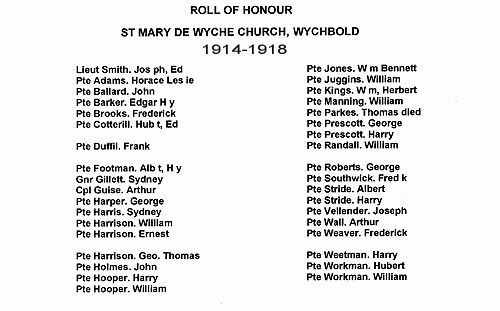 The names of Wychbold’s war dead are recorded on the lychgate at the church of St Mary de Wyche and are listed below. Further information has been added where readily available from the Commonwealth War Graves Commission (www.cwgc.org). Private Horace Leslie Adams died 15/9/1916 aged 20. Royal Fusiliers. Son of Andrew and Sarah Adams of 1 Shrubbery Terrace, Stoke Works. Private John Ballard died 10/8/1915. Worcestershire Regiment. Private Albert H Footman died 9/11/1917 aged 19. Worcestershire Regiment. Son of Joseph and Mary Footman of 25 Sagebury Terrace, Stoke Works. Gunner Sydney George Gillett died 30/9/1917 aged 21. Royal Garrison Artillery. Son of Albert Henry and Jane Gillett of Chapel Lane, Wychbold. Corporal Arthur Guise died 26/3/1918 aged 22. Sherwood Forresters. Son of David and Jessie Guise of Kingsland Hill, Wychbold. Private Sydney Harris died 21/5/1915 aged 21. Worcestershire Regiment. Son of William John and Myra Harris of 22 Causeway Meadows, Stoke Works. Private John Edward Walters Holmes died 24/10/1918 aged 24. Worcestershire Regiment. Son of Thomas and Elizabeth Holmes of Oddingley, Droitwich. Private Harry Hooper died 20/4/1916 aged 25. Worcestershire Regiment. Son of George Hooper of Wychbold. Private William Harry Manning died 24/8/1916 aged 21. Worcestershire Regiment. Son of William and Elizabeth Manning of Shaw Lane, Stoke Works. Private Thomas Parkes died 5/4/1918 aged 35. Royal Berkshire Regiment. Son of Eliza Parkes of Rashwood, Droitwich. Husband of Ada Parkes of Barrow Hill, Chaddesley Corbett. Private Frederick Southwick died 24/4/1917 aged 30. Worcestershire Regiment. Husband of Susan E. Barnett (formerly Southwick) of 13 Causeway Meadows, Stoke Works. Private Joseph Vellender died 6/2/1917 aged 30. Training Reserve. Son of Joseph and Sarah Vellender of 19 Sagebury Terrace, Stoke Works. Buried in St Mary de Wyche churchyard. Private Frederick Weaver died 9/10/1917 aged 35. Worcestershire Regiment. Son of William and Agnes Weaver of Dodderhill Common. Lieutenant Reginald Campbell Hurley died 4/9/1944 aged 21. Rifle Brigade. Awarded MC. Son of Reginald William and Lucy Jessie Hurley. Private Frederick B Footman died 27/8/1944 aged 32. Worcestershire Regiment. Son of Joseph and Mary Footman. Husband of Evelyn Elizabeth Footman. Trooper Lawson Wallace Hall died 28/8/1944 aged 22. Royal Tank Regiment RAC. Son of Hezekiah and Alie Frances Hall of Wychbold. Private Frederick Henry Bourne died 28/5/1940 aged 23. Worcesterhire Regiment. Sergeant John Westwood died 12/2/1943 aged 22. Royal Air Force Volunteer Reserves. Husband of Eleanor May Westwood of Wychbold. 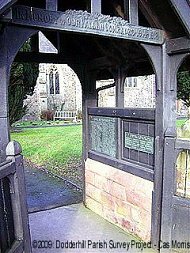 The Roll of Honour is found inside the lych-gate. Above the gate is a dedication to the men.